Your junior year of high school can be overwhelming—there are a number of key tasks to complete before the school year draws to a close. With the last day of school quickly approaching, today is a great time to begin preparing and finalizing your college admissions plan. 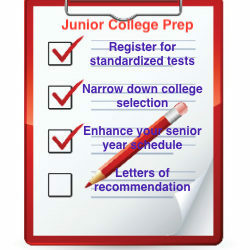 You can start tackling college admissions tasks by registering for standardized tests, researching ways to enhance your college application, analyzing the admissions requirements of your schools of interest, and more. If you haven’t done so yet, use the spring months to identify which college entrance exams you will take. The first step is to research which tests your schools of interest prefer, if any. Typically, schools will accept both ACT and SAT test scores, but do a bit of digging to see if they tend to favor one exam over the other. It’s also key to discover if your specific schools require or recommend SAT subject tests. Once you’ve identified which exams you intend to take, note their registration deadlines and test dates so you can best plan your test prep schedule. Be sure to allot ample prep time when selecting your testing dates, as choosing a testing date too near in the future could lead to lower-than-anticipated test scores. Again, if you haven’t done so already, begin to research ways to earn college credit and to build your college admissions resume. Meet with your guidance counselor to learn about opportunities within your school to earn dual college credit. Often, high schools partner with local colleges to offer such courses. Aside from standard dual credit courses, you may also choose to take AP or IB classes to enhance your college resume. Discuss with your guidance counselor what the best options for you may be and how to best proceed. Additionally, begin to research possible internships and summer jobs in your intended field of study. This will both allow you to gain experience in your potential major and showcase to colleges that you are serious about your career goals. At this point in the college admissions cycle, you likely have five to 10 schools you’re planning to apply to. In order to further narrow down your selections, it’s important to be honest with yourself about what you want to get out of your college experience. Conduct further online research regarding specific aspects of the school you feel are most important to you, schedule a campus tour if possible, and reach out to the admissions department with any questions you may have. Also, take this time to identify the application requirements of each school, noting specific deadlines and required material to submit with your application. You can prevent future application stress by laying out all requirements ahead of time to ensure you don’t accidentally miss a deadline. Plan to get at least three letters of recommendation confirmed before the end of the school year. Identify teachers, coaches, and other mentors you feel have a firm understanding of you as both a student and an individual. Colleges will want a glimpse into how you perform academically and how you carry yourself in your everyday life. By asking teachers and other adults now, you give them enough time to compose a thoughtful and comprehensive recommendation letter. With the stress of finals still a bit of time away, now is an excellent time to begin outlining your college admissions plan of action. Research standardized tests, discover ways to enhance your application—such as dual credit courses or summer internships—and begin to gather letters of recommendation. By completing these tasks, and noting all application deadlines for your schools of interest, you’re on the right track to college admissions success. UniversityTutor.com is the world's largest global marketplace for finding independent tutors.